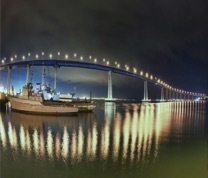 SelectBIO is delighted to host this Liquid Biopsies 2019 Conference at the beautiful Coronado Island Marriott Resort & Spa. Coronado, also known as Coronado Island, is a resort city located in San Diego County, California, across and around San Diego Bay from downtown San Diego. Coronado Island is only 7.4 miles from the San Diego International Airport (Airport Code: SAN). SelectBIO has negotiated discounted hotel room rates at this conference venue for delegates at the rate of US$219 per night (State and Local Taxes Extra). This rate includes complimentary high-speed internet in the guest rooms. This discounted room rate is valid through March 13, 2019 so we kindly recommend you book early before the room block sells out. Please note that the resort fee charged by the hotel is optional and you can request the resort fee to be removed during the booking process (the resort fee covers optional activities at the hotel). Once you click the green button above, a new webpage dedicated to the conference venue hotel will open up and will provide you with the discounted conference delegate pricing. At this point, please proceed to type in the dates required, and complete the booking process.